According to the American Diabetes Association, diabetes mellitus afflicts more than 25 million people in the United States. Unfortunately, nearly one-third are unaware that they have the disease. Diabetic eye disease, also known as diabetic retinopathy, can severely damage the retina before patients notice any loss of vision. Diabetic retinopathy is also a common cause of low vision. 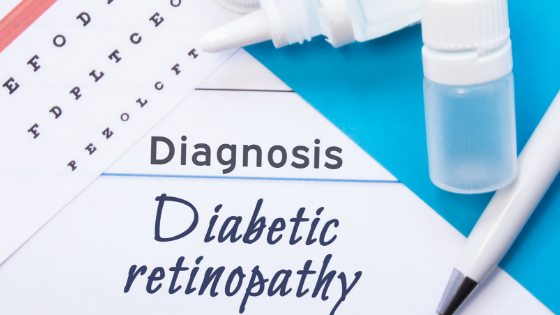 For these reasons, diabetic patients require routine examinations with an eye care professional to detect and follow the progression of diabetic retinopathy. The main culprit in the development of diabetic retinopathy is uncontrolled diabetes or high blood sugar. The severity of diabetic retinopathy is directly related to blood sugar control. The retina, the light-sensitive layer in the back of the eye, has a rich supply of blood vessels. When blood sugar levels become too high, these blood vessels are weakened. The blood and fluid inside the blood vessels leak out into the retina. New blood vessels grow, but they are fragile and may also leak fluid. This causes the retina to swell and become deprived of nutrients and oxygen, causing vision loss and possibly blindness. The initial step in a diabetic eye exam is to dilate the eye so that your eye care professional can look through a special lens to see the back of your eye. A flourescein angiography test may be done to determine if any blood vessels in the retina are blocked or leaking fluid. This test also shows if any abnormal blood vessels are growing. A yellow dye called fluorescein is injected into a vein, usually in your arm. The dye travels through your blood vessels. A special camera takes photos of the retina as the dye travels throughout its blood vessels. Optical coherence tomography (OCT) is another test done to look closely at the retina. It is essentially an optical ultrasound and provides a cross-sectional view of the retina. With this test, a machine scans the retina and provides detailed images of its thickness to help find and measure swelling of the macula. The macula is a specialized area close to the center of the retina which is crucial to the central vision needed for reading and other detailed visual tasks. Nonproliferative Diabetic Retinopathy (NPDR) is an early stage in which tiny blood vessels in the eye leak blood or fluid. The leaking fluid causes swelling, which can cause visual changes such as blurred or distorted vision. Patients with NPDR do not always have visual changes, but when they do it is in the central vision. Peripheral or side vision is not usually involved. Proliferative Diabetic Retinopathy (PDR) is the next stage. When the retina, the nerve layer in the eye responsible for most of your vision, doesn’t get the blood, oxygen and nutrients it needs due to poorly-treated diabetes, it sometimes responds by growing new, abnormal vessels on the surface of the retina or optic nerve. These new, abnormal vessels are very weak and tend to cause scarring of the retina. This condition may cause more severe vision loss than NPDR as it affects both central and peripheral vision. If left untreated, proliferative diabetic retinopathy can cause severe vision loss and even blindness. The earlier it is treated, the more likely treatment will be effective. Medication can be injected into the eye to help reduce the effects of retinal swelling. Scatter laser surgery is used to shrink the abnormal blood vessels, called a vitreous hemorrhage, in one or more treatment sessions. The body will usually absorb blood from a vitreous hemorrhage, but that can take time. If additional treatment is needed to correct a hemorrhage, or if a retinal detachment is detected, an operation called a vitrectomy can be performed. During a vitrectomy, the eye surgeon removes the blood and the abnormal blood vessels that caused the bleeding. The doctors at Carolinas Centers for Sight, P.C. have the knowledge, experience and expertise in the field of ophthalmology to help patients improve their vision. Consultations with expert retina surgeons are available in our Florence office for those with active diabetic retinopathy. Call 843-664-9393 today to schedule an appointment. New patients accepted.